Churchill was a technophile of the first order. He thoroughly enjoyed getting his hands on new inventions. He involved himself deeply in wartime technological development and spent much of his time with physicist Professor Lindemann. His interest seems to have been driven both by a boyish fascination with new toys and by the sobering realization that such toys were necessary to survive modern war. Churchill, however, did not only push for technological innovation; he also thought carefully about the dangers and benefits of technology. From his earliest military campaigns to his last important speech in the House of Commons, Churchill recognized the dangers inherent in technology, especially during war. In a time increasingly dominated by technology, both Churchill’s enthusiasm and his cautions are worthy of consideration. Churchill’s interest in technology was most evident and documented during World War II. The conflict, he said, was “a war of science, a war which could be won with new weapons.”1 He acted in accordance with this understanding and historians have since vindicated him; scientific improvements in everything from radar to bombs shaped the course and outcome of the war. The Toyshop produced many devices that were used to great effect in the war. One of the earliest was a magnetic mine, called the limpet mine, which would attach to the bottom of a ship. There were also anti-tank weapons, fuses whose delay lasted up to twenty-four hours, and a variety of anti-personnel mines. One of his interests, Radio Detection-Finding—later known as radar—was one of the major developments of the war and Churchill knew it. As First Lord of the Admiralty, he urged that each ship be fitted with radar.5 He and Lindemann developed a radar device that could be carried in every airplane to allow them to follow enemy planes in the dark (codename Smeller).6 During the Battle of Britain, Churchill repeatedly pushed for the development of a system which could connect searchlights and rockets to radar systems, allowing them to act as targeting devices. These and other developments were necessary for ultimate victory. Without radar, and therefore without the ability to see the enemy coming, the Battle of Britain would have been nearly impossible. Submarines would have been far more deadly and shipping more difficult. And radar was only one of several major developments in the “Wizard War”. Churchill’s interest in and advocacy for war technology was not newly formed in World War II. During the First World War, Churchill advocated for expanding the use of the newly developed airplane and of the Royal Naval Air service. In WWI, he was also intensely interested in intercepted intelligence and code-breaking, and eagerly read freshly decrypted communications.7 However, his most famous contribution to war technology was his strong and consistent advocacy for the tank and its technological predecessors. On September 23, 1914, Churchill sent his “first formal proposal for a mechanical device to influence trench warfare.”8 In this case, he wanted to build trench-spanning cars, both for bridging cuts in the road and for crossing wider trenches. This was one of Churchill’s many suggestions urged to prevent the wholesale slaughter of trench warfare. Churchill entirely rejected this soulless approach to war. Instead, he sought ways to mitigate the inevitable suffering and death of war. To this end, he was perpetually interested in using mechanical devices to overcome the deadlock of the western front. The bridging vehicle was his first suggestion, but certainly not his last or his most important. It would be quite easy in a short time to fit up a number of steam tractors with small armoured shelters, in which men and machine guns could be placed, which would be bullet-proof. Used at night, they would not be affected by artillery fire to any extent. The caterpillar system would enable trenches to be crossed quite easily, and the weight of the machine would destroy all wire entanglements. 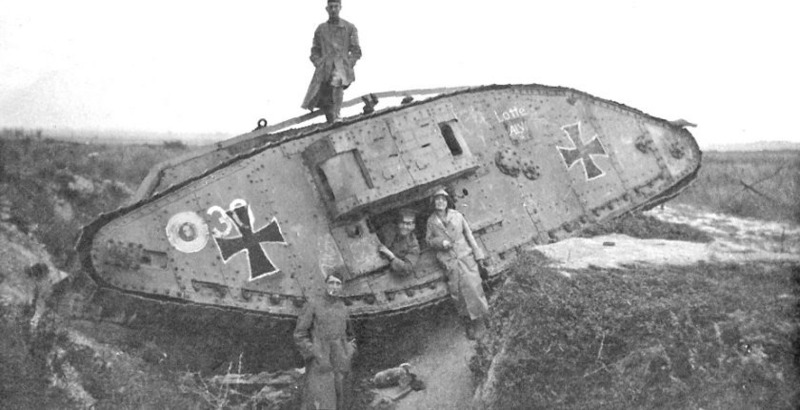 Featured Image: Civilians pose with an German tank, captured on the Hindenburg Line (circa 1918). About the Author: Nathaniel is recent graduate of Hillsdale College’s Van Andel Graduate School. As a student, he was made a member of the Winston Churchill Fellowship Program. He is currently establishing a classical Christian school in Fort Wayne, IN. 1 Martin Gilbert, Winston S. Churchill, vol. 6: Finest Hour 1939-1941 (New York: Rosetta Books, 2015), 678. 4 Taylor Downing, Churchill’s War Lab (New York: Overlook Press, 2010), 92. 7 Churchill’s War Lab, 38. 8 Martin Gilbert, Winston S. Churchill, vol. 3: The Challenge of War, 1914-1916 (New York: Rosetta Books, 2015), 534. 9 Winston S. Churchill, The World Crisis, vol. 2: 1915 (Norwalk, Connecticut: The Easton Press, 1991), 20. 11 The Challenge of War, 40.